The name BMW has always stood for luxury and sophistication. This extends to every type of vehicle that they produce. 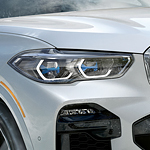 So if you are looking for a Sports Activity Vehicle such as the 2019 BMW X5, then you can expect it to be a luxurious capable vehicle to drive around [location] in. You will soon discover after you arrive at [dealer] that the BMW X5 comes in two dynamic power trains. The first is the six-cylinder X5 XDrive40i that reaches 60 mph in 5.3 seconds and outputs 335 HP. If you want more power, then the eight-cylinder X5 XDrive50i is available for you. This engine produces 436 HP and goes from 0-60 in 4.6 seconds. Inside of the X5 drivers will be greeted by impressive and informative technology. There are standard dual 12.3-inch displays, one for the Digital Instrument Cluster the other for the Center Display. Both provide a world of information and can be integrated with an optional HUD.